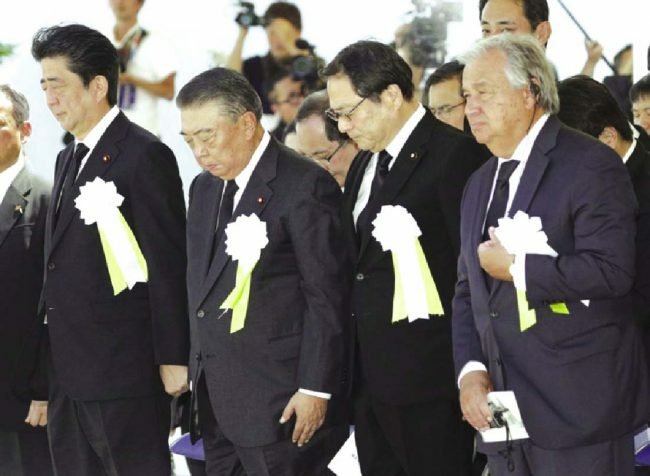 AP: Nagasaki marked the anniversary of the world’s second atomic bombing Thursday with the United Nations’ chief and the city’s mayor urging global leaders to take concrete steps toward world nuclear disarmament. Secretary-General Antonio Guterres, the first United Nations chief to visit Nagasaki, said fears of nuclear war are still present 73 years after the Nagasaki and Hiroshima bombings and that they should never be repeated. He raised concerns about the slowing effort to denuclearize, saying existing nuclear states are modernizing their arsenals. The peace and nuclear disarmament movement, started by survivors of the atomic bombings, has spread around the world but frustration over the slow progress led to last year’s adoption of the Treaty on the Prohibition of Nuclear Weapons. Japan, despite being the only country in the world to have suffered nuclear attacks, has not signed the treaty, because of its sensitive position as an U.S. ally protected by its nuclear umbrella. Nagasaki Mayor Tomihisa Taue urged Japan’s government to do more to lead nuclear disarmament, especially in the region to help advance the efforts to achieve a nuclear-free Korean Peninsula. He said citizens of the atomic-bombed cities are hoping to see North Korea denuclearized. Taue said he hoped Japan’s government would take the opportunity to realize a nuclear-free Northeast Asia, including Japan and the Korean Peninsula. Taue urged Tokyo to sign the treaty and “fulfill its moral obligation to lead the world towards denuclearization.” He said more than 300 local assemblies have adopted resolutions calling on Japan to sign and ratify the treaty. Japan seeks to close the gaps between nuclear and non-nuclear states to eventually achieve a nuclear-free world, said Prime Minister Shinzo Abe, repeating almost the same phrase he used in his speech three days ago in Hiroshima. The bombing of Nagasaki on Aug. 9, 1945, was the second U.S. nuclear attack on Japan, killing 70,000 people, three days after the bomb dropped on Hiroshima killed 140,000. They were followed by Japan’s surrender, ending World War II.